All our trailers are fitted with twist-locks to carry single 20’ and 40’ containers, as well as 2x20’ containers. All cargo is secured and covered with tarpaulins to protect the cargo from the elements. We are able to handle “dangerous goods” upon request. 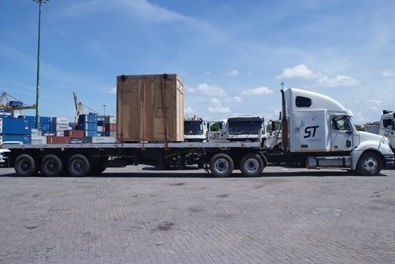 For us to evaluate the feasibility to handle your cargo kindly provide us with all details as per the International Maritime Dangerous Goods (IMDG) Code such as the IMO class, UN Number and Packing group.